There’s a comprehensive form on the contact page, use it if you want us to help you plan a custom mountain biking holiday in Romania. We promise a fast reply. The best way to discover Romania’s mountains is on a bike, pedaling up and down the mountain trails, through lush forests and flowery pastures, deep in the mountain gorges or up on the ridges. The Romanian mountains aren’t particularly big, but the views are simply stunning and their diversity is one of a kind. 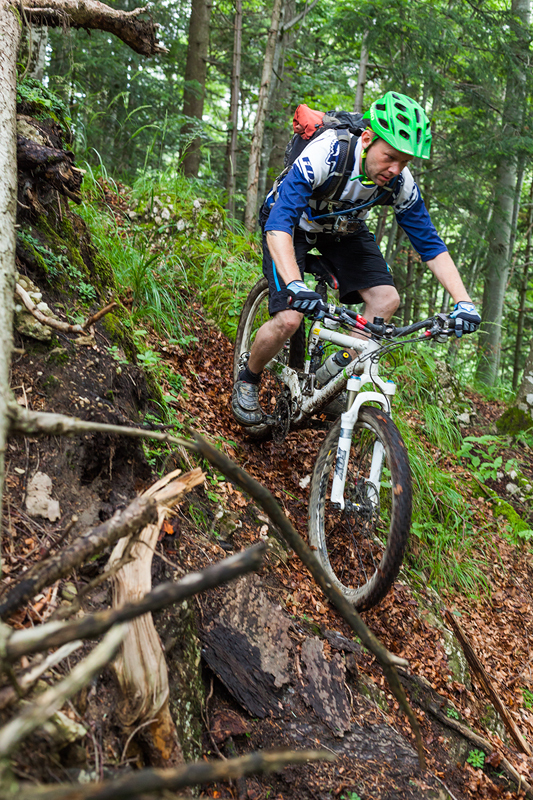 Our mtb tours are cross-country, all-mountain and in the last years they get more and more touches of enduro. We’re no different than most of the bikers in the world, preferring more and more riding on trails. Young riders tend to be more downhill oriented, carrying up the bike on a car, bus or cable-car and then rushing down the trails. We are “old-style”, we also enjoy the going up on the bike: somehow the pleasure of the descent isn’t full if you haven’t worked hard your way up. Our tours aren’t easy, they are quite demanding physically and technically, both on the uphill and the downhill. But the feeling of true accomplishment at the end of each day is, quite honestly, something special. Going mountain biking in the Romanian mountains on your own is always a valid option. If time is on your side, if you like exploring and discovering places, than go for it. However, you should know that the specific mountain biking trail signaling or mapping is very poor, if non-existent. You’ll need to do a lot of research before any ride and most likely you won’t be able to find the best trails available. We’ve been searching, testing, exploring, enjoying the trails around Bucegi, Piatra Craiului, Postăvaru, Baiului, Cindrel Mountains for more than fifteen years. We’d love to share all that experience with you. Iulian Cozma (mountainguide.ro) is in the business of organizing adventure tourism in Romania since early 2000. The mountainbiking tours are the most recent entries, following a wide range of mountain activities that include trekking, mountaineering, hill-walking, nordic-walking, ski touring, free-ride skiing and snowboarding, and snow-racket tours. We share with Iulian the same passion for mountain activities, we grew up in these mountains and we are now growing old with them. But there’s more to it than just the mountains: its people. They live their lives up there, herding the sheep, working the hay, farming the land. Meeting these people, talking with them, visiting their houses, eating their food is an essential part of the Romanian mountains experience. It’s more than sports, it’s a unique socio-cultural experience that we are always trying to provide for the tourists we guide through our mountains. Mountain guiding is a demanding job and we are doing it with full responsibility. We are licensed mountain guides since 1998 and members of the RMGA (Romanian Mountain Guides Association). It’s not just a job, but also our passion, so we are doing it with enthusiasm and openness. Read through the testimonials various people were kind enough to provide for mountainguide.ro after experiencing Romania and you’ll see that, apart from the mountain activities, we also bring to the table an essential side ingredient for a great time and a good holiday: a pleasant company. It goes both ways: the people we guide into the Romanian mountains are open minded, genuinely interested in finding more about the places and the people they are visiting, eager to share their life experiences with us. Along the years they were Americans, Canadians, Germans, French, British, Dutch, Austrian, Italians, Swiss, Swedes, Danish, Belgians, Israeli, Russians, Lithuanians, etc. It was a genuine joy meeting all the people in this ever growing list. 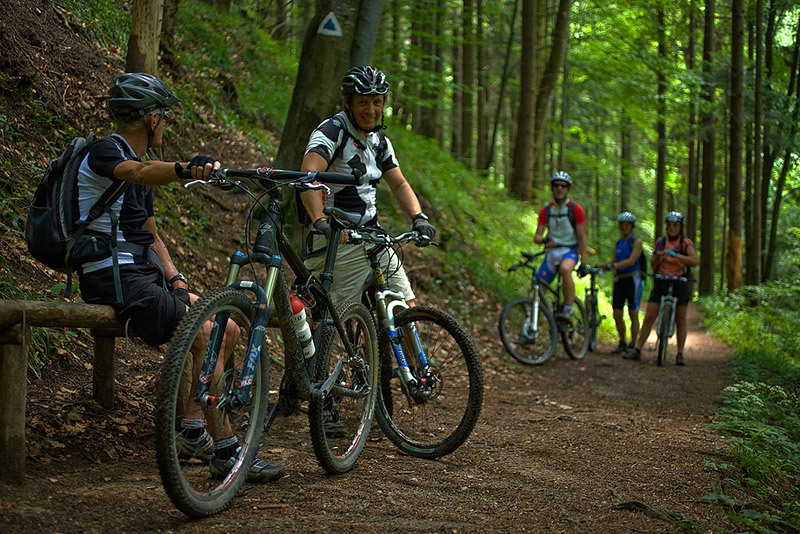 Our tours are about having a great time mountain biking, and some. At the end of the biking day you want to share all the excitement with your friends along a pint of beer, a glass of wine or a shot of the local brandy, sitting around a nicely laid table, enjoying the local food. That’s precisely what we’ll provide for you. The “Romanian cuisine” is quite basic and somewhat heavy on the stomach, populated with dishes not really tailored for a high-class restaurant but perfectly suited for a hungry, energy-deprived mountain biker. The local history and geography shaped it to be easy to produce, high in proteins, sharing influences from both the byzantine world and the Austria-Hungary empire. If there is a place where the Romanian dishes are to be tried, it’s where they are still produced and eaten for day-to-day needs: in the countryside. After a full working day of mountain biking you won’t be counting the calories piled up in a plate full of “ciorbă”, “sarmale”, “tocăniţă”, “bulz”, etc. The locals here need very consistent food in order to put up with the exhausting daily activities, like cutting the grass with a scythe or piling up the hay with a fork. Pedaling up and down the trails is equally demanding. You’ll appreciate how most of the ingredients are produced locally, with the cheese coming from a sheepfold like the one you just visited up the mountains, the poultry farmed in the backyard, the local brandy distilled from fruits growing around the house. In more than 10 years of organizing tours, Iulian Cozma developed a network of local food and accommodation providers. The benefits are important both for the tourists, who get the chance to immerse further in the local life (and not having the same standardized tourist facilities available everywhere in the world), and the local communities who get a chance for a valuable income. In a world where globalization gets more and more headlines, this approach might be considered outdated. We see it as both socially responsible and cultural-exchange facilitating. It happens frequently to our guests to simply fall in love with the places they stayed in and ate at. We are pretty sure this might also happen to you. “Come here before Romania joins the European Union”. That was the advice of an Englishman living in the North of Romania in the early 2000 to the tourists willing to visit our country. Apart from his traditional British euro-skepticism, his point was that in Romania one could still find a way of life that was lost in the Western Europe. Romania joined the European Union in 2007 but the reasoning is still valid. In the rural areas you can still see people working the hay the old way, with a scythe and a fork, with horse drawn carts, with sheepfolds where the cheese is still done as in the medieval ages. Most of the households are involved in what officials from Bucharest or Brussels call “subsistence agriculture”. The vast majority of mountains remain free of cable cars, ski slopes, ski resorts, railway tunnels or motorway bridges. Going out into the Romanian mountains still feels like half-way between traveling in time and escaping into the wild.